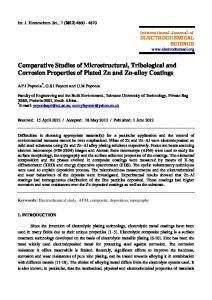 Jun 1, 2012 - Corrosion Properties of Plated Zn and Zn-alloy Coatings ... zinc-aluminum deposition on the rest potential of golden and non-chromates zinc-. Dec 18, 2017 - However, the welding efficiency of GMAW and GTAW with solid ...... gas pulsed welded joints from X2CrNiMoN22-5-3 duplex stainless steels. a b s t r a c t Superhydrophobic coatings have become a hot research topic in recent years due to their excellent properties and wide practical applications. In the present work, hierarchical nickel ﬁlms having intrinsic super-hydrophilic property were fabricated on copper substrate by two-step electrodeposition process. The surface structure and composition were characterized by means of scanning electron microscopy (SEM), X-ray diffraction pattern (XRD) and atomic force microscopy (AFM). The contact angle of water droplets on the hierarchical structure of nickel ﬁlms increased over time, eventually becoming large enough to classify the surface as superhydrophobic. The surface morphology of nickel ﬁlm at micro/nano scale was characterized at different deposition current densities (10–70 mA cm−2). Results showed that the value of roughness and the size of micro/nano cones were decreased by increasing the current density. 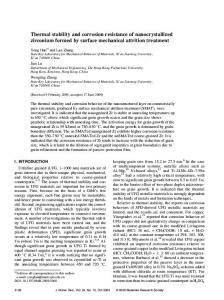 The nickel ﬁlm deposited at 20 mA cm−2 displayed the highest superhydrophobicity with water contact angle of 155°, which could be attributed to its pine conelike structure. Electrochemical measurements and long-term immersion test showed that the superhydrophobic nickel ﬁlms greatly enhanced the corrosion resistance of copper substrate in neutral 3.5 wt.% NaCl solution. The corrosion protection of superhydrophobic ﬁlms was attributed to small area of real contact with the aggressive solution. © 2015 Elsevier B.V. All rights reserved. ⁎ Corresponding author. E-mail address: [email protected] (S. Khorsand). http://dx.doi.org/10.1016/j.surfcoat.2015.11.005 0257-8972/© 2015 Elsevier B.V. All rights reserved. equipment [8,16]. In contrast, electrodeposition has been used as a one step, simple and economic method to fabricate superhydrophobic surface on different substrates [6,8]. Copper has properties such as low cost, high thermal and electrical conductivity, but it is corroded easily. So, creating a superhydrophobic surface is one of the methods used for modifying its surface . Xi et al. prepared a superhydrophobic surface on hydrophilic copper substrate via electroplating at large current density to produce various degrees of roughness without chemical modiﬁcations. Xu et al. improved the corrosion resistance of copper by fabricating a suprehydrophobic composite coating. Up to now, a few papers have been published on superhydrophobic nickel ﬁlms produced on copper substrate by electrodeposition without applying low surface energy materials. These researches have usually studied the morphology and wetting behavior of the coatings. However, there is no systematic study on the effect of deposition current density on physical properties, wetting behavior and corrosion resistance of super-hydrophobic nickel ﬁlms. In the present work, fabrication of superhydrophobic nickel ﬁlm with micro-nano cone array on copper substrate was done only by electrodeposition without applying any low surface energy materials. Surface morphology, super-hydrophobicity characteristics and corrosion resistance of nickel ﬁlms electrodeposited at different current densities were investigated by scanning electron microscopy, water contact angle measurement and the electrochemical technique. Fig. 1. SEM images of nickel ﬁlms deposited at current density of 20 mA cm−2 at different magniﬁcations, (a, b) micro nickel ﬁlm, and (c, d) micro-nano nickel ﬁlm. Fig. 2. SEM images of micro-nano nickel ﬁlms deposited at current density of: (a, b) 10 mA cm−2, (c, d) 30 mA cm−2, (e, f) 50 mA cm−2, and (g, h) 70 mA cm−2. automatic multi-liquid dispenser, monochromatic cold light source and the accompanying software. The initial contact angle values reported the mean values from ﬁve measurements made on different locations of the sample surface. The X-ray diffraction patterns of Ni ﬁlms were obtained using Philips X'pert MPD diffractometer. The diffractometer was operated using Cu-Kα at an accelerating voltage of 40 kV and a current of 40 mA. A standard Nano scope III atomic force microscope (AFM) was employed in the contact mode to observe the surface topography of Ni ﬁlms obtained at different current densities. surface roughness was not varied signiﬁcantly, probably due to the homogenous structure of micro and nano cones on the surface of coating. Fig. 3. XRD patterns of superhydrophobic nickel ﬁlms deposited on copper substrate. Fig. 4. AFM micrograph of nickel ﬁlms deposited at current density of: (a) 10 mA cm−2, (b) 20 mA cm−2, and (c) 50 mA cm−2. Fig. 5. Photographs of water droplet on: (a) freshly smoothed nickel ﬁlm, (b) smooth nickel ﬁlm after two weeks, (c) freshly prepared micro-nano nickel ﬁlm at 20 mA cm−2, (d) micronano nickel ﬁlm prepared at 20 mA cm−2 after two weeks, (e) micro-nano nickel ﬁlm prepared at 70 mA cm−2 after two weeks and (f) a snapshot of water droplet rolling off the nickel ﬁlm prepared at 20 mA cm−2 after 90 days. Table 4 The water contact angle for superhydrophobic nickel ﬁlms. Potentiodynamic polarization plots of copper substrate, the freshly electrodeposited Ni ﬁlms (superhydrophil) and air exposed Ni ﬁlms (superhydrophob) in 3.5 wt.% NaCl solution are presented in Fig. 6. Corrosion current density (icorr) and corrosion potential (Ecorr) extracted from the intercept of Tafel slopes are summarized in Table 5. Fig. 6. Potentiodynamic polarization curves of copper bare substrate, freshly micro-nano nickel ﬁlms and the superhydrophobic nickel ﬁlms in neutral 3.5 wt.% NaCl solution. Fig. 7. Nyquist plots of (a) freshly nickel ﬁlms deposited at different conditions, and (b) copper substrate and superhydrophobic nickel ﬁlms at different conditions in 3.5 wt.% NaCl solution. Fig. 8. Equivalent electrical circuits of: (a) copper substrate, and (b) freshly prepared nickel ﬁlms and superhydrophobic nickel ﬁlms. capacity for superhydrophobic specimens had been decreased considerably. Therefore, superhydrophobic ﬁlms could provide an excellent and successful protective effect for the substrate. As mentioned before, air layer is stabilized within the grooves of super-hydrophobic ﬁlms, considerably reducing the penetration of the corrosive ions such as Cl− and improving the corrosion resistance [29,31]. It is also worth noting that the diameter of capacitive loop for the superhydrophobic ﬁlm deposited at 20 mA cm−2 was larger than that of others (Fig. 7b). This indicated that this ﬁlm had the highest corrosion resistance. To ﬁnd the reason for this behavior, it is necessary to consider the deposit property which affects the corrosion resistance. For the superhydrophobic specimens, according to Cassi–Baxter model, surface morphology and roughness can be more effective on trapping the amount of air in the grooves . In this study, the roughness of superhydrophobic coatings was approximately similar to each other. The higher water contact angle and excellent corrosion protection of the superhydrophobic ﬁlm deposited at the current density of 20 mA cm−2 can be referred to as coating morphology. The hierarchical pine cone-like structure of Ni ﬁlm deposited at 20 mA cm−2 can probably generate numerous grooves in which air may be trapped easily. Fig. 9. Nyquist plots of superhydrophobic nickel ﬁlms at 20 mA cm−2 with different immersion times in 3.5 wt.% NaCl solution. 3.4. Long-term stability of superhydrophobic nickel ﬁlm In order to estimate the long-term stability of superhydrophobic ﬁlm fabricated at 20 mA cm−2, EIS measurements were done at different immersion times in 3.5 wt.% NaCl solution. The results are presented in the form of Nyquist plots in Fig. 9 and the ﬁtted parameters are shown in Table 8. It is obvious that the capacitive loop unexpectedly became larger for a few days after immersion in corrosive solution. The capacitive loop gradually became larger until 6 days and then it started to decrease. Table 6 The impedance parameters extracted from Nyquist plots in Fig. 7a. Table 8 The impedance parameters extracted from Nyquist plots in Fig. 9. Fig. 10. SEM images of micro-nano nickel ﬁlm deposited at 20 mA cm−2 after immersion in 3.5 wt.% NaCl solution for 15 days. considerably (Fig. 1c) and only the tips of nano-cones were corroded, causing the round tops and some parts of the ﬁlm covered by corrosion products. 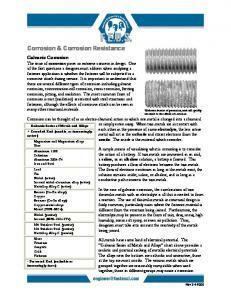 It could be assumed that the corrosion products ﬁlled the grooves of the coating surface and decreased the penetration of corrosive solution. Therefore, the formation of the passive layer and partial blocking of the surface could be considered as the reasons for the increase of charge transfer resistance observed at the initial times of immersion [32,33]. 4. Conclusions To summarize, corrosion resistant and superhydrophobic nickel ﬁlms with a hierarchical structure were synthesized by directional electrodeposition process. The relationship between the wettability and surface morphology was studied using different deposition current densities. 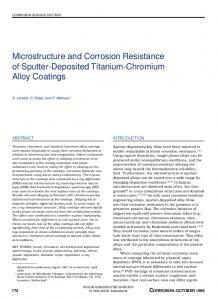 Also, corrosion resistance of different nickel ﬁlms was established. The following conclusions can be drawn: (1) The superhydrophobic nickel ﬁlms showed better corrosion resistance than copper substrate and fresh micro-nano structure nickel ﬁlms. The corrosion resistance of the superhydrophobic surface was closely related to their wettability. (2) The Ni ﬁlm deposited at 20 mA cm−2 exhibited the best superhydrophobicity with a contact angle of 155°. The superhydrophobicity of this coating was derived from its pine cone-like structure and adsorption of organic hydrocabons. (3) It was conﬁrmed that the superhydrophobic Ni ﬁlm fabricated at 20 mA cm−2exhibited high stability when immersed in 3.5 wt.% NaCl solution after several days. At the initial times of immersion, the charge transfer resistance was raised because the formation of passive layer on the surface of Ni ﬁlm. (4) The inhibition mechanism of hierarchical superhydrophobic nickel ﬁlms, as shown from electrochemical measurements, was the result of a very low wetted area obtained on the solid surface immersed in the aggressive solution and the shift of corrosion potential toward positive values. References  W. Zhang, Z. Yu, Z. Chen, M. Li, Preparation of super-hydrophobic Cu/Ni coating with micro-nano hierarchical structure, Mater. Lett. 67 (2012) 327–330. P. Wang, D. Zhang, R. Qiu, Extreme wettability due to dendritic copper nanostructure via electrodeposition, Appl. Surf. Sci. 257 (2011) 8438–8442. T. Kako, A. Nakajima, H. Irie, Z. Kato, K. Uematsu, T. Watanabe, K. Hashimoto, Adhesion and sliding of wet snow on a super-hydrophobic surface with hydrophilic channels, J. Mater. Sci. 39 (2004) 547–555. D. Yu, J. Tian, J. Dai, X. Wang, Corrosion resistance of three-layer superhydrophobic composite coating on carbon steel in seawater, Electrochim. Acta 97 (2013) 409–419. O.-U. Nimittrakoolchai, S. Supothina, Deposition of organic-based superhydrophobic ﬁlms for anti-adhesion and self-cleaning applications, J. Eur. Ceram. Soc. 28 (2008) 947–952. T. Hang, A. Hu, H. Ling, M. Li, D. Mao, Super-hydrophobic nickel ﬁlms with micronano hierarchical structure prepared by electrodeposition, Appl. Surf. Sci., 256 (2010) 2400–2404. S. Khorsand, K. Raeissi, F. Ashraﬁzadeh, Corrosion resistance and long-term durability of super-hydrophobic nickel ﬁlm prepared by electrodeposition process, Appl. Surf. Sci. 305 (2014) 498–505. Z. Chen, L. Hao, A. Chen, Q. Song, C. Chen, A rapid one-step process for fabrication of superhydrophobic surface by electrodeposition method, Electrochim. Acta 59 (2012) 168–171. B. Tuffy, Superhydrophobic surfaces by simple production methods, School of Physical Sciences, Dublin City University, 2008. H.C. Barshilia, N. Gupta, Superhydrophobic polytetraﬂuoroethylene surfaces with leaf-like micro-protrusions through Ar + O2 plasma etching process, Vacuum 99 (2014) 42–48. Y. Zhang, W. Li, F. Ma, Z. Yu, M. Ruan, Y. Ding, X. Deng, Optimum conditions for fabricating superhydrophobic surface on copper plates via controlled surface oxidation and dehydration processes, Appl. Surf. Sci. 280 (2013) 898–902. S. Rezaei, I. Manoucheri, R. Moradian, B. Pourabbas, One-step chemical vapor deposition and modiﬁcation of silica nanoparticles at the lowest possible temperature and superhydrophobic surface fabrication, Chem. Eng. J. 252 (2014) 11–16. W.-H. Huang, C.-S. Lin, Robust superhydrophobic transparent coatings fabricated by a low-temperature sol–gel process, Appl. Surf. Sci. 305 (2014) 702–709. J. Liu, X. Xiao, Y. Shi, C. Wan, Fabrication of a superhydrophobic surface from porous polymer using phase separation, Appl. Surf. Sci. 297 (2014) 33–39. W. Xi, Z. Qiao, C. Zhu, A. Jia, M. Li, The preparation of lotus-like super-hydrophobic copper surfaces by electroplating, Appl. Surf. Sci. 255 (2009) 4836–4839. Z. Chen, F. Tian, A. Hu, M. Li, A facile process for preparing superhydrophobic nickel ﬁlms with stearic acid, Surf. Coat. Technol. 231 (2013) 88–92. G. Wang, T.-Y. Zhang, Oxygen adsorption induced superhydrophilic-tosuperhydrophobic transition on hierarchical nanostructured CuO surface, J. Colloid Interface Sci. 377 (2012) 438–441. X. Xu, L. Zhu, W. Li, H. Liu, A variable hydrophobic surface improves corrosion resistance of electroplating copper coating, Appl. Surf. Sci. 257 (2011) 5524–5528. U. Sarac, M.C. Baykul, Effect of applied current density on morphological and structural properties of electrodeposited Fe–Cu ﬁlms, J. Mater. Sci. Technol. 28 (2012) 1004–1009. M. Moravej, S. Amira, F. Prima, A. Rahem, M. Fiset, D. Mantovani, Effect of electrodeposition current density on the microstructure and the degradation of electroformed iron for degradable stents, Mater. Sci. Eng. B 176 (2011) 1812–1822. J. Liang, D. Li, D. Wang, K. Liu, L. Chen, Preparation of stable superhydrophobic ﬁlm on stainless steel substrate by a combined approach using electrodeposition and ﬂuorinated modiﬁcation, Appl. Surf. Sci. 293 (2014) 265–270. Z. She, Q. Li, Z. Wang, L. Li, F. Chen, J. Zhou, Researching the fabrication of anticorrosion superhydrophobic surface on magnesium alloy and its mechanical stability and durability, Chem. Eng. J. 228 (2013) 415–424. M.R. Zamanzad-Ghavidel, K. Raeissi, A. Saatchi, Effect of substrate texture and deposition current density on properties of Ni nanocrystalline electrodeposits, Iran. J. Mater. Sci. Eng. 9 (2012) 1–14. P. Wang, D. Zhang, R. Qiu, Liquid/solid contact mode of super-hydrophobic ﬁlm in aqueous solution and its effect on corrosion resistance, Corros. Sci. 54 (2012) 77–84. A.B.G.S. Subhash Latthe, C. Shridhar Maruti, R. Shrikant Vhatkar, Recent progress in preparation of superhydrophobic surfaces: a review, J. Surf. Eng. Mater. Adv. Technol. 2 (2012) 76–94. E. Celia, T. Darmanin, E. Tafﬁn de Givenchy, S. Amigoni, F. Guittard, Recent advances in designing superhydrophobic surfaces, J. Colloid Interface Sci. 402 (2013) 1–18. S. Khorsand, K. Raeissi, F. Ashraﬁzadeh, Super-hydrophobic nickel–cobalt alloy coating with micro-nano ﬂower-like structure, Chem. Eng. J. 273 (2015) 638–646. J. Long, M. Zhong, H. Zhang, P. Fan, Superhydrophilicity to superhydrophobicity transition of picosecond laser microstructured aluminum in ambient air, J. Colloid Interface Sci. 441 (2015) 1–9. T. Ishizaki, J. Hieda, N. Saito, N. Saito, O. Takai, Corrosion resistance and chemical stability of super-hydrophobic ﬁlm deposited on magnesium alloy AZ31 by microwave plasma-enhanced chemical vapor deposition, Electrochim. Acta 55 (2010) 7094–7101. 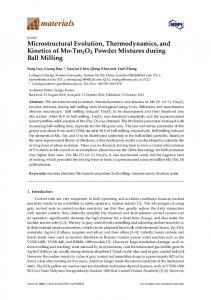 J. Zhang, Z. Kang, Effect of liquid–solid contact models on the corrosion resistance of superhydrophobic magnesium surfaces, Corros. Sci. 87 (2014) 452–459. Y. Liu, X. Yin, J. Zhang, S. Yu, Z. Han, L. Ren, A electro-deposition process for fabrication of biomimetic super-hydrophobic surface and its corrosion resistance on magnesium alloy, Electrochim. Acta 125 (2014) 395–403. T. Ning, W. Xu, S. Lu, Fabrication of superhydrophobic surfaces on zinc substrates and their application as effective corrosion barriers, Appl. Surf. Sci. 258 (2011) 1359–1365. A. Kocijan, D.K. Merl, M. Jenko, The corrosion behaviour of austenitic and duplex stainless steels in artiﬁcial saliva with the addition of ﬂuoride, Corros. Sci. 53 (2011) 776–783. 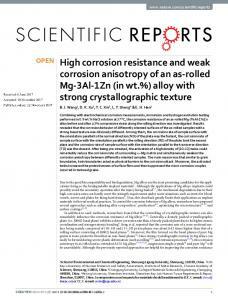 Report "Microstructural evolution and corrosion resistance of"